North Korean leader Kim Jong Un is ready to talk to the US about abandoning his country’s nuclear arms and pursuing peace, South Korea said on Tuesday. Denuclearization has been the major roadblock in peace on the Korean Peninsula for decades, but now Kim seems willing to negotiate. North Korea said it would not need nuclear weapons if the “safety of its regime be guaranteed,” according to a South Korean official. North Korean leader Kim Jong Un is ready to talk to the US about abandoning his country’s nuclear arms and pursuing peace with South Korea, according to the South Korean president’s office, the Blue House. After historic between South Korean diplomats and North Korean leader Kim Jong Un, North Korea is apparently open to denuclearizing, with Kim himself reportedly expressing a willingness to talk to the US about the touchy subject – something unthinkable mere months ago. North Korea also said it would suspend provocations like nuclear and missile tests during negotiations, the Blue House said Tuesday. Under Kim, North Korea wrote the possession of nuclear weapons into its constitution, and it has bitterly opposed any efforts to rid the country of its weapons. The US has maintained that it will denuclearize North Korea whether by force or by diplomacy, making the subject of denuclearization the major roadblock toward peace on the Korean Peninsula since 1994. 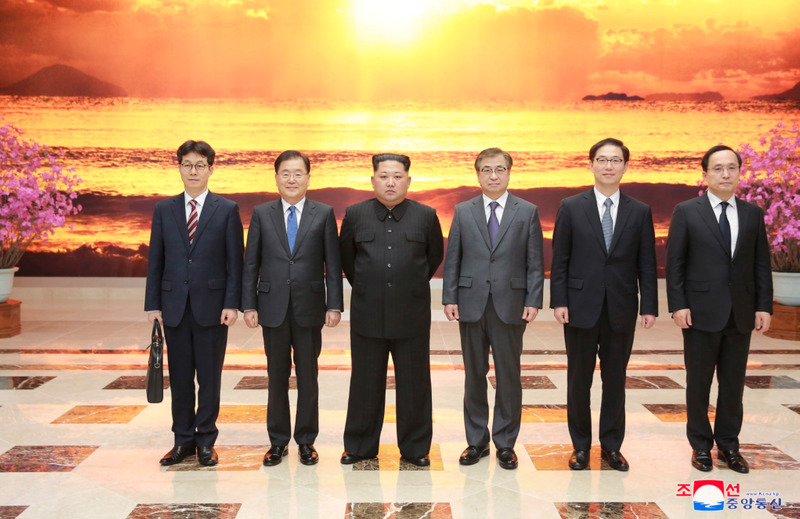 “The North side clearly affirmed its commitment to the denuclearization of the Korean Peninsula and said it would have no reason to possess nuclear weapons should the safety of its regime be guaranteed and military threats against North Korea removed,” Chung Eui-yong, the director of South Korea’s National Security Office, who attended the latest meetings, said, according to Yonhap. “In addition, the North promised not to use not only nuclear weapons but also conventional weapons against the South,” he added. The news follows a year packed with white-hot nuclear threats and increasingly provocative nuclear and missile tests carried out by North Korea. The US put together the harshest sanctions package ever against the country and increased its military posture, with President Donald Trump making some overt threats. But even as the US has applied what the Trump administration calls a “maximum pressure” approach, South Korea, under the new leadership of a more engagement-minded liberal political party, extended olive branches to Pyongyang by including the North in the Pyeongchang Olympics and holding talks that thawed relations. 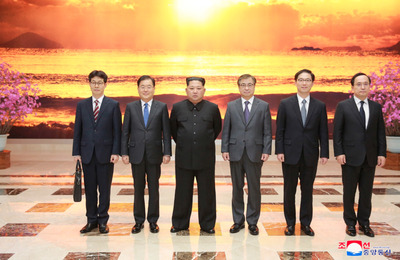 KCNAKim meeting with South Korean officials in Pyongyang, North Korea. North Korea appears to have changed its tone after repeatedly declaring its nuclear arsenal nonnegotiable and reserving the right to attack US forces stationed in South Korea. North Korea has talked about denuclearization before, but promises fell through before implementation. South Korean and US officials have repeatedly said verifiable denuclearization would need to take place before larger discussions over peace or reunification of the Koreas could happen. Yonhap reports that the groundwork has now been laid for Kim to meet South Korean President Moon Jae-in, in what would be Kim’s first meeting with another head of state. North Korean media reported on Monday that Kim wanted to “write a new history of national reunification” and would “rapidly take practical steps” toward creating peace between the two countries, which have technically been at war since 1950. North Korea had previously refused to engage with the US as long as international sanctions and the US military in the region applied pressure to Kim’s government.